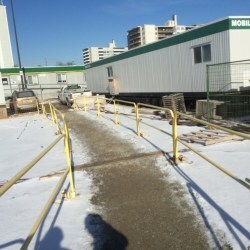 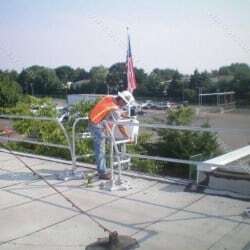 It is becoming standard procedure to install rooftop guardrails in the final stages of a building project as it is often a requirement before certain companies will allow their service workers to attend to the building. 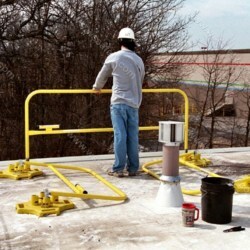 Protect rooptop workers and eliminate potential trip hazards with our selection of OSHA-compliant rooftop fall protection guardrail systems.All of the rooftop guardrail products that we offer are manufactured in North America and are non-penetrating, which means that they will not void your rooftop warranty. 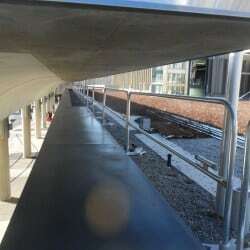 SafetyRail 2000 Architectural Guardrail combines our non-penetrating guardrail system with an architectural appeal for those applications where appearance of the railing is important. 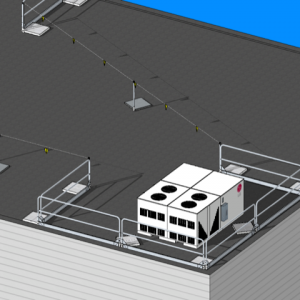 The patent-pending SafetyRail 2000FG is the perfect temporary guardrail system for free standing roof edge protection when telecommunication equipment is present and can't have metal guardrails that will interfere with RF signals. 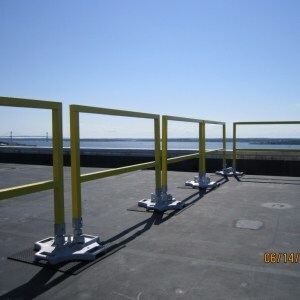 Tech-Rail Guardrails are the answer to a cost effective, aesthetically pleasing, and easy to install non-penetrating guardrail system. 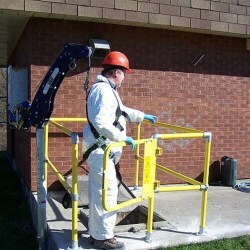 They are an engineered system featuring galvanized steel trays, aluminum or galvanized rails, concrete patio stone, and optional toeboards.